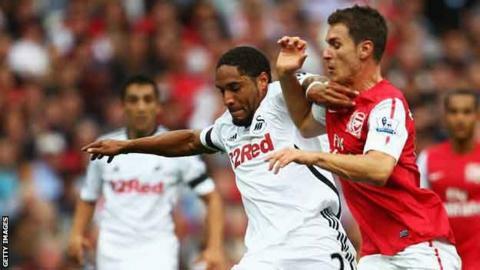 Ashley Williams says reclaiming the Wales captaincy from Aaron Ramsey will not be regarded as a "big deal" between the players. After not winning in four games as boss, Chris Coleman gave Williams the role for the World Cup qualifiers against Scotland and Croatia. Swansea's Williams, 28, says the decision came as a suprise. "Me and Aaron probably won't even speak about the captaincy. It's not a big deal," said defender Williams. "Whoever the gaffer chooses as captain, that's it… when I wasn't the captain I still tried to influence the game and you just play your own game, really." Ramsey was appointed skipper by previous manager Gary Speed in March 2011 - aged just 20 years and 90 days - and made his first appearance as captain in his 12th Wales cap in their 2-0 Euro 2012 qualifying defeat by England. The Caerphilly-born midfielder led Wales 12 times, winning five and losing seven games. But Coleman, who took over in January following Speed's death, has opted to replace Ramsey. Williams, has led Wales to a win and three defeats in his 36-cap career since making his debut in 2008, scoring once. But he believes that having himself found no difficulty after previously lost the national team's captaincy, he does not expect any issues to arise this time around. He added: "It wasn't [difficult] for me [to lose the captaincy]. "As long as you're in the team that's the main thing and you get on with it. "I think people are going to make a lot of it when it isn't really that inside the camp. "It was a surprise, yeah of course, when the gaffer told me that's what he wanted me to do. "It's a great honour, obviously, to be the captain and I've done it before. "I enjoy it and hopefully we can change things around a little bit." The 36-cap player says Wales' players will merely be concentrating on try to erase the memory of their 6-1 loss in Serbia. That is the only occasion on which Wales have scored under Coleman and Williams admits the clash against Scotland at Cardiff City Stadium is a must-win encounter. The defeat by Serbia came in the wake of a 2-0 setback against Belgium. "We've got to win that [against Scotland] and I think you'll see a reaction from the last game and it'll be a totally different performance." Wales visit Croatia in Osijek on 16 October. Wales Squad: Jason Brown (Aberdeen), Lewis Price (Crystal Palace), Owain Fôn Williams (Tranmere Rovers), Darcy Blake (Crystal Palace), Ben Davies (Swansea City), Chris Gunter (Reading), Joel Lynch (Huddersfield Town), Adam Matthews (Celtic), Sam Ricketts (Bolton Wanderers), Ashley Williams (Swansea City, capt), Joe Allen (Liverpool), David Edwards (Wolverhampton Wanderers), Andy King (Leicester City), Joe Ledley (Celtic), Aaron Ramsey (Arsenal), David Vaughan (Sunderland), Gareth Bale (Tottenham Hotspur), Simon Church (Reading), Steve Morison, (Norwich City), Hal Robson-Kanu (Reading), Sam Vokes (Burnley).